Root rot and wilt, caused by a complex involving Fusarium chlamydosporum (Frag. and Cif.) and Ralstonia solanacearum (Smith), are serious diseases affecting the cultivation of Coleus forskohlii, a crop with economic potential as a source of the medicinal compound forskolin. The present 2-year field experiments were conducted with two bioinoculants (a native Pseudomonas monteilii strain and the exotic arbuscular mycorrhizal (AM) fungus Glomus fasciculatum) alone and in combination under organic field conditions in order to evaluate their potential in controlling root rot and wilt. Combined inoculation of P. monteilii with G. fasciculatum significantly increased plant height, plant spread, and number of branches; reduced disease incidence; and increased tuber dry mass of C. forskohlii, compared to vermicompost controls not receiving any bioinoculants. Increase in tuber yields was accompanied by an increase in plant N, P, and K uptake. Co-inoculation of P. monteilii with G. fasciculatum significantly improved the percent AM root colonization and spore numbers retrieved from soil. 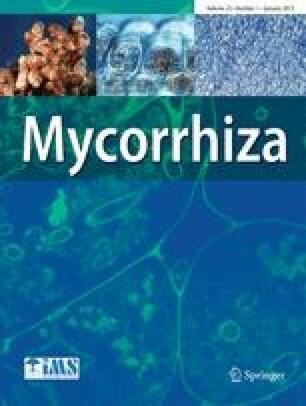 This suggests P. monteilii to be a mycorrhiza helper bacterium which could be useful in organic agriculture. The forskolin content of tubers was significantly increased by the inoculation treatments of P. monteilii, G. fasciculatum, and P. monteilii + G. fasciculatum. The authors thank the National Medicinal Plants Board, New Delhi for providing financial support; the Council of Scientific and Industrial Research (CSIR), New Delhi, India for providing facilities; and Dr. K.V.N.S. Srinivas (Phyto-chemist, CIMAP, Research Centre, Hyderabad, India) for forskolin estimation; scientist-in-charge, CIMAP Research Centre, Bangalore; and Director, CSIR-Central Institute of Medicinal and Aromatic Plants, Lucknow, India, for encouragement and facilities.